When cooking, the trick is not always in the recipe used or even in the experience of the chef, but rather in things as simple as the cookware you make use of. Although pots and cooktops can make cooking a breeze, they can also make it a hellish experience if the wrong ones are selected. It is, for this reason, that many cooking novices are opting for induction cooktops over gas and electric ones because of the overwhelming advantages they come with, including fast cook time and energy efficiency. Even avid campers and round the world travelers have found solace in this piece of equipment. If you are in the market for cookware that will offer a more pleasurable experience, here are some of the best portable induction cooktops. The DUXTOP 1800-Watt Portable Induction Cooktop is one of the most popular induction cooktops out there, with many entrusting it to deliver delicious three-course meals with ease. Users have rated it as the best choice and have good reason too; this kitchenware comes with almost all the features and more that one would need in a cooktop. But before we get into the features, one of the first things we noticed with the DUXTOP 1800-Watt is that when handled, it is extremely lightweight, which is surprising considering that cooktops are well known to be built with more heavy duty materials. What’s more, this piece makes use of electricity of 120 volts and 15 Amps and meets the electric standard for use in most homes. As for the features, it offers an easy-to-use digital control panel with up to 10 temperature settings that range from 140 to 460 Degree Fahrenheit and with its countdown timer, you get to set it anywhere from a minute to 170 minutes. With this, you can easily decide how fast you want your cooking done. Still on the control features, you have a power level that rises from 200 to 1800 Watts which serves to give the luxury of cooking at a lower heat to prevent food from getting burnt. Be sure to combine this with a cool Dutch oven from our list. It is designed to automatically shut down when it does not detect cookware after 60 seconds. When it comes to an uptight design, functionality, and performance, there aren’t that many cooktops that would stand up to the Secura 9100MC 1800W Portable Induction Cooktop. Although excellently designed, it still offers a certain ‘je ne ce quoi’ which could be the simple and minimalistic design; hence, its ease of use. It also comes with an LED display for digital control with a built-in digital timer which can be set from a minute to up to 170 minutes. More than that, however, this cooktop offers 15 power levels that rise to up to 1800 from 200 Watts. You can’t deny that this is power efficient for your home whilst still offering a temperature range that goes as high as 460 Degree Fahrenheit from 140 Degree Fahrenheit. So, in just a snap of a finger, a tasty meal can be served. Needless to say, this kitchen gadget does get hot pretty fast, so it’s best to be cautious. Cooking is no longer just a necessary evil to supply with food energy. On the contrary: cooking yourself is an essential key to enjoyment, health, and well-being. Those aware of the benefits of self-cooking will be able to handle a cooktop with a clear conscience whether you are a beginner cook or a pro. For those on the lookout for a heavy duty cooktop, the Cuisinart CB-30 Cast-Iron is another option. It is also the one to recommend for larger household use as it offers up on space. The Cuisinart Countertop is a brushed stainless steel cookware, designed with non-slip rubber feet and with a power of 1300 watts, thanks to the fact that it doesn’t waste time heating up while also retaining heat as it cooks. As regards the temperature, it offers six control levels from which you can choose, offering modest flexibility. However, the only downside is that it does not come with a digital control or temperature indicator. 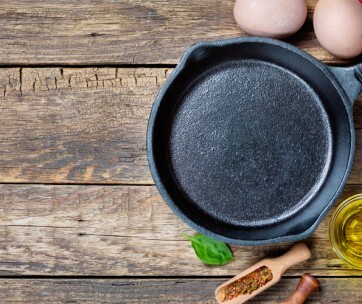 Be sure to also check out our list of the best iron skillets for more great items like this. At the higher end of portable induction cooktops is the Duxtop LCD 1800-Watt, which is furnished with almost every feature that one may be looking for. It makes use of the standard 120 volts whilst still being a lightweight and compact piece, which makes it easy to use and handle. More so, it offers a digital control panel and an LCD display. Another feature to look out for is the digital timer that counts down from 1 minute to as high as 10 hours. As regards the power level of the cooktop, it has up to 20 levels that start at 100 watts going up to as high as 1800 Watts. In the same way, it also offers 20 temperature levels, ranging from 100°F to 460°F. Above everything else, it is a very versatile piece that is compatible with cast aluminum enameled iron as well as stainless steel. 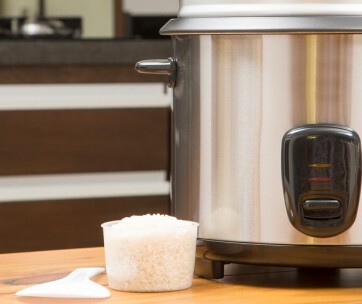 Our handy guide to the best rice cookers features more great products like this. If elegance and detailed control are what you have your mind on, the iSiLER 1800W Sensor Touch Electric Induction Cooker Cooktop may just be the one for you. This wear resistant and easy to maintain cooktop offers a wide surface to allow for heat to spread evenly whilst still being portable and lightweight in design for ease of transportation and usage. Like most others on the list, the power level ranges from 100 watts to 1800 watts across its 9 power levels. As regards the temperature of the cooktop, it ranges from 140°F to 460°F which can be selected from 8 pre-set levels that are at 40°F increments. It has a timer from a minute to up to three hours which can be increased by a minute or by 10 minutes when pressed for longer. Let’s not forget to mention that it also features a premium glass surface for easier cleaning and maintenance since it is also wear resistant. Love this product? Check out our review of the best convection ovens for our top picks. The Rosewill RHAI-15001 1800-Watt Induction Cooker is not the heaven and earth of cooktops, but it is probably one of the most detailed induction cooktops that one would find. It allows you to simply select what you want to do whether it is to warm milk, soup, fry, or anything else you have in mind. It offers a beautiful surface with digital easy to follow controls along with a power level of up to 1800 Watts. As the temperature can heat up to 450°F, you are offered free will to decide how fast to cook your meal. More so, the five pre-settings and the 24-hour time setting are some additional features not too many induction cookware offers. The only downside is that as it is not so much of a versatile cookware piece, it offers cookware suitability detection to help you understand the appropriate cookware to use. Find more great products like this by checking out our guide to the best slow cookers. Multiple heating zones and cooking modes are more benefits that come with portable induction cookers and the NutriChef PKSTIND48 Dual Electric Induction Cooker Cooktop is at the top of its game. It is a dual induction cooker that offers two heating zones that are both independently configured. The idea behind this is to offer a cooktop that will be versatile and save space that you would have lost had you gone for two. The different zones both have their own temperature settings and LCD digital controls. Even at that, the induction burner is very power efficient at 120V. Either side of the heating zone offers up to 1800 Watt of heating power, even though the heat range is not specified. That said, the heating element still functions in an exceptional way and heats up food almost instantly depending on your settings. If you are unsure of which setting to opt for, you can also make use of the maximum timer setting of up to 4 hours. Lastly, we can’t finish without mentioning that this cooktop is versatile enough to be used with any of your steel kitchen cookware. Don’t forget to also check our guide to the best deep fryers. Cooking like a professional has been made easy with the Duxtop LCD P961LS Professional. A versatile piece that can serve for home, restaurant, or other professional use, it’s top of the range when it comes to usability. For the temperature controls, it pretty much offers the same as you would expect with most others; 100 to 460 ℉. However, it goes up a notch by offering 20 different temperature levels from 100 to 1800 Watts. Other features include the large Digital LCD display that makes it easier to use the cooktop, adjust the settings, and also monitor what you are cooking. Whether you want to keep your food warm or hot, you also have the options to do that. Also, for the countdown digital timer, you can select from a minute to up to 10 hours and in the line of safety, it is kitted with auto-pan detection, diagnostic message system, voltage warning system, and lock system. If you love making food, check out our guide to the best air fryers. If you prefer not to dig too deep in your pocket, yet still desire a long-lasting and reliable cooktop, the hOmeLabs Portable Induction Cooktop may as well be both the head and tail for you. This portable induction hot plate is one of the easiest to use as all the settings are well-detailed within the LCD control. It is also compact and easy for both storage and transportation. 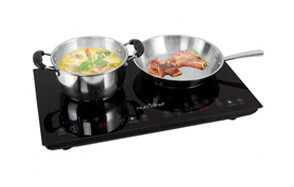 The surface of the Induction stove comes with a magnetic field that lets you know if your cookware is supported or not. 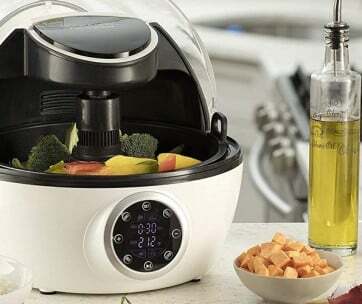 It features six use modes including the Mode, Boil Mode, Warm Mode, and Boost Mode and comes built with a timer and 10 heating levels from 120W to up to 1500W. Obviously, it doesn’t offer the same power level that you get with the others which give 1800W, but for the other features it offers, this is still a good bargain. This also makes a perfect gift for foodies in your life. The Max Burton #6450 is not the most popular one in the lot, but it is by no means, one that can be ignored, especially if you are after a power efficient cooktop that is compact, lightweight, and easy to use. This induction burner is designed rather differently from most others with an emphasis on saving space while not losing its beauty. A 120V AC Power piece, it comes with 15 different temperature settings that range from 100°F to 450°F and can be increased at 25°. In addition to the 180-minute programmable timer, the cooktop offers many safety features that include a system that shuts down in case of overheating, wrong cookware use, short circuit, or any problem that may damage the equipment. It’s also worth mentioning that if in use for three hours non-stop, it automatically shuts down. 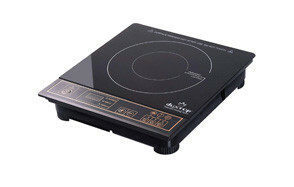 Brand - There are many brands of induction cooktops from which you can select. While some are more expensive than others, it does not necessarily mean that such are automatically better than the rest. In our research, we have taken a look at many brands including DUXTOP, Secura, Cuisinart, and iSiLER among many others. From these, our team selected the very best models available. Reviews - Apart from all that our research team drew while trying out these and other products, we have also taken to many other platforms and have gone through reviews from users of these portable cooktops in real-world situations and in their homes. More so, we have taken a look at all the strengths and weaknesses of the various cooktops before listing the best the market has to offer. Price - Of course, the price is also very important, no matter what you are looking to get. With this review, we have looked for different portable cooktops that fall in all price range; those that are of premium value and those that are less expensive. Even though the price, as stated, is important, we do not place the price above the functionality, features, ease of use, and durability that each comes with; since being expensive does not necessarily mean being better. 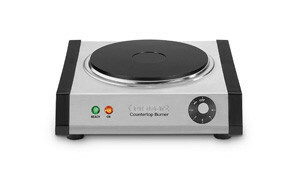 There are many things to look out for when you want to buy a portable induction cooktop, but the emphasis would always be on the temperature it delivers, its controls, size, and of course, the safety features. Temperature - In terms of the temperature, anything from 100℉ to 450℉ will be very good to go with. However, there are those that will offer much higher and up to 10 control levels. The importance of the temperature is that it can decide how fast or slow your food gets cooked. Controls - There are two options that you get with the control; the digital control and the manual. Going with a digital control with an LCD display and touch sensor is the best option. The advantage is that you can easily make adjustments and you get to see and monitor how your cooking is going. Size - When concerning size, it’s best to opt for a cooker that is compact and portable enough to be carried around. Safety features - A very good induction cooktop will come with a variety of safety features that would not only prevent it from damaging but will also make cooking seamless and not cause harm to other household members, most especially children. The safety feature you want to look out for is the Safety Lock. Also, vital is to look out for diagnostic features, temperature, and high voltage.